Hello hello crafty peeps! Scrappin "Toxic" Midge here. One thing a person can just never have enough of is Birthday Cards :) Today I have a card with a wobble to share with you. Here is a shot of the balloon "Wobblin'"
I already know just who will be receiving this one! I hope you liked my card today! 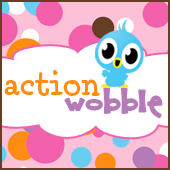 If you would like to get some Action Wobbles of your own, you can go to the Scrapbooking Queens Royal Castle Shoppe by clicking here. That's right never too many! So cute and fun!